If you know me, you probably have learned that I have a little thing for tiki bars. It’s developed slowly over time from a casual curiosity to a committed affinity — these days when I travel I always check to see if there is a tiki bar to visit in the area. Many more articles to come on this topic, I’m sure, especially because I have a fun tiki-driven research project that I’ll be diving into later this year (…more on that soon). But for now, I want to share a deep dive on a submarine-themed concept I’ve been working on called The Acey-Deucey Club. 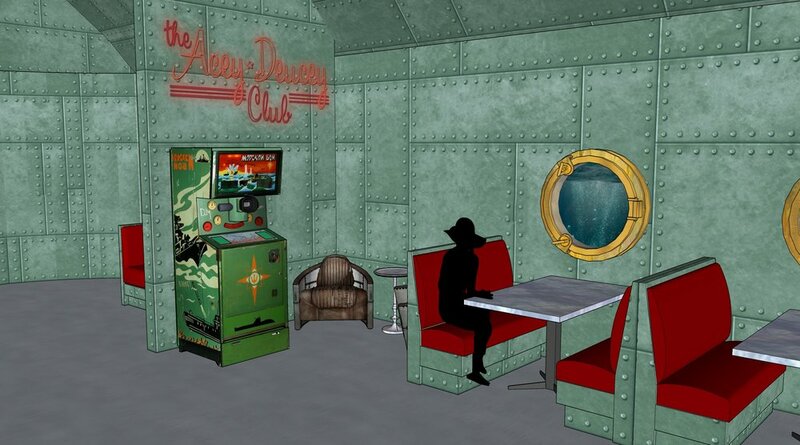 At its core, The Acey-Deucey Club is a tiki bar with a nostalgic WWII nautical and submarine-theme overlay. 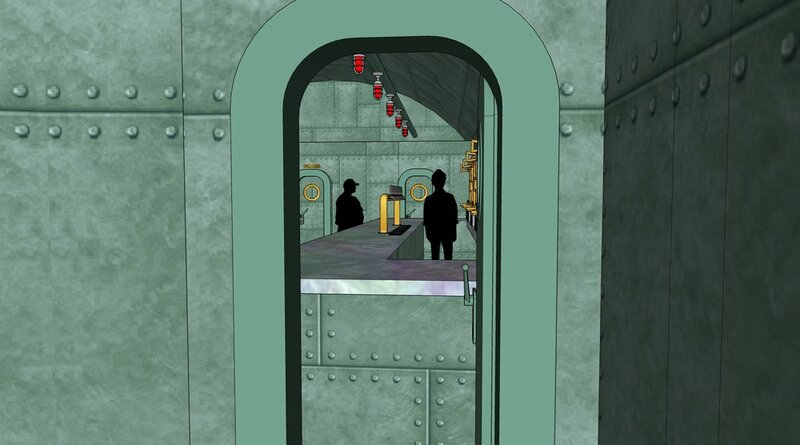 Like a speakeasy, guests are encouraged to gain access or make a reservation via the submarine telecommunication booth from the hotel lobby. 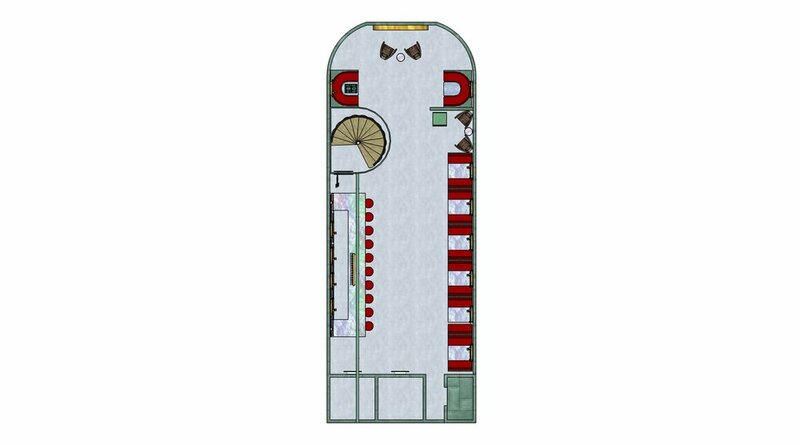 Once access permission is obtained, guests traverse down through the porthole stairway into the Club where they are met by a crew of nautically dressed sailors and waitstaff. 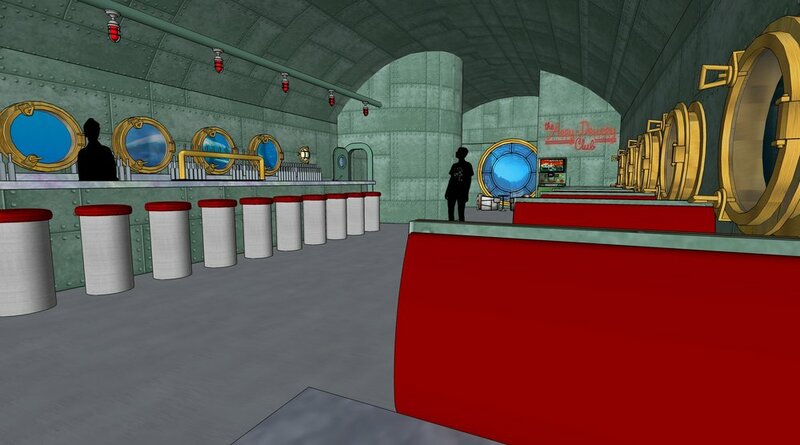 The space itself takes the form of a submarine with a long narrow cavernous feel, rounded ceiling, and plated metal. Porthole windows line the walls of the space behind the mother of pearl bar and seating area where guests can look out and take in the aquatic views. 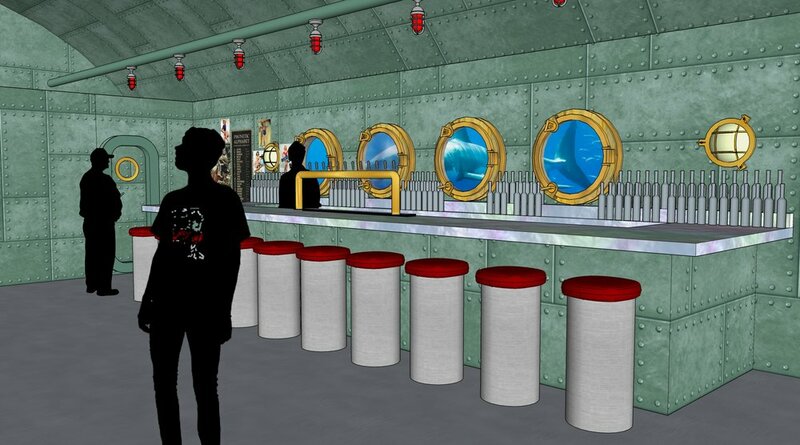 The portholes will be outfitted with digital monitors that give the illusion of floating through the depths of the sea complete with sea-life, real and mythical. The largest monitor window sits at the nose of the submarine, similar to Jules Verne’s Nautilus. Here guests can take in the wonders of the ocean and feel the thrill of being on board a submarine. 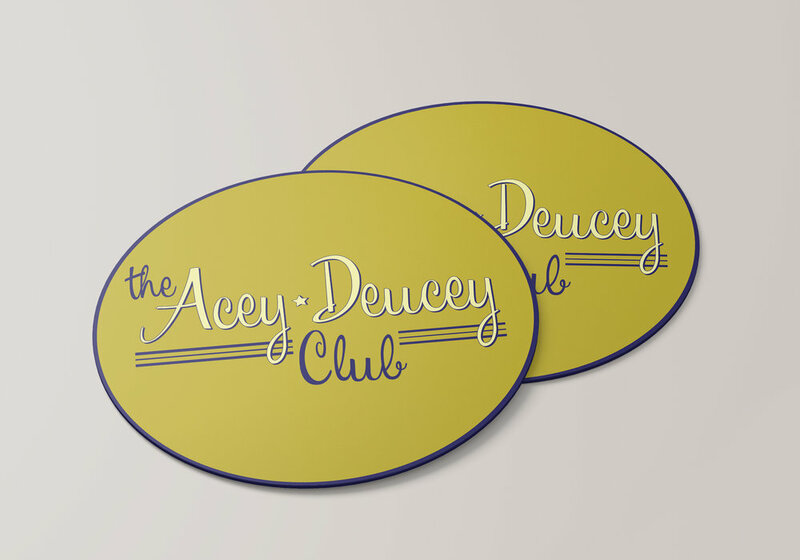 Beside being designed as a themed space, The Acey-Deucey Club has a dash of show quality too. As is tiki tradition, a handful of the signature libations available have accompanying interactive elements that encourage participation from all bar guests, and trigger effects (including lighting, audio, haptic, etc.) in the submarine when the drink is delivered. My personal favorite is the Alpha Mike Foxtrot: a boozy concoction that triggers the sinking sequence of the submarine complete with alarms, flashing red lights, and steam bursts from the overhead pipes at which point there’s nothing left to do but turn to your neighbor, say “Adios Mother F*cker”, and take a drink. 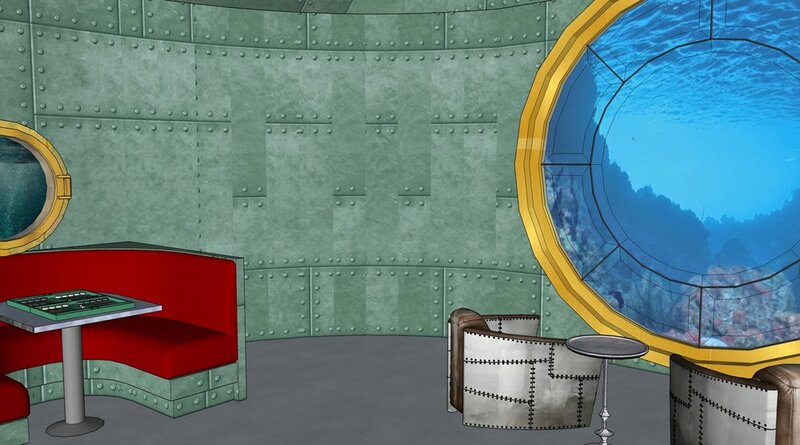 The footprint of the space is small to create an intimate submarine feeling and an exclusive environment. Guests may truly feel like they’ve stepped into a functional vessel as well a a time capsule from the first half of the 20th century. The Acey-Deucey is equal parts kitsch, nostalgia, and high production value. The logo I designed reflects these elements by using a retro script font that could be associated with the likes of a speakeasy or a jazz club. The name itself stems from a variation of backgammon popular among sailors of the armed forces as well as a slang term for a private club for First- and Second-Class Petty Officers. After concepting the design and defining the look and feel on paper, I experimented with Sketchup to create a 3D model. This was my first foray into Sketchup and was pretty impressed with the results — I’m sure this will be the first of many to come.